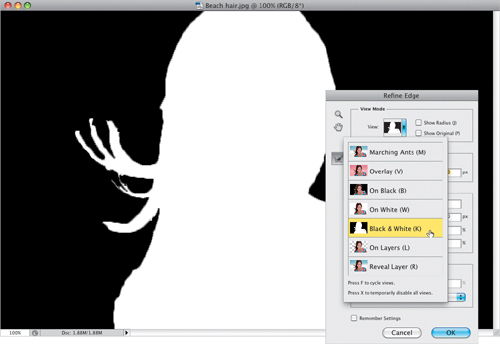 Most of the selecting jobs you’ll ever have to do in Photoshop are pretty easy, and you can usually get away with using the Magic Wand, Lasso, or Pen tools for most jobs, but the one that has always kicked our butts is when we have to select hair. 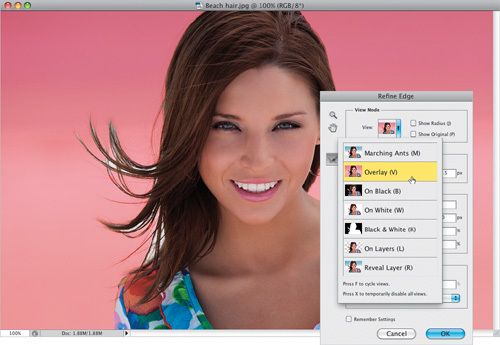 Start by opening the image you want to make a selection in, and getting the Quick Selection tool from the Toolbox (as shown here). 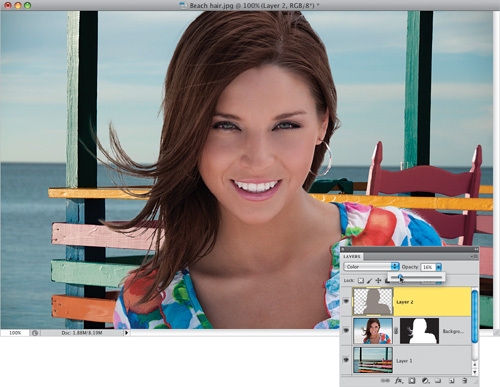 If you’re thinking this is the same tool from Photoshop CS4...well, you’re right. But, it’s the new features in Refine Edge that make it really powerful. If you never used the Quick Selection tool back in CS4, here’s how it works: you just take it and paint loosely over the areas you want to select, and it kind of expands to select the area (kind of like a much smarter version of the Magic Wand tool, but using different technology). Take the tool and paint over your subject. Don’t forget the flyaway hair on the left side. If it selects too much, press-and-hold the Option key and paint over that accidentally selected area to remove it from your selection. Remember, it’s not going to look perfect at this point, but that’s what the Refine Edge control is for, so go ahead and click the Refine Edge button up in the Options Bar (as shown here). When the Refine Edge dialog appears, you have a lot of choices for your View Mode (including just the standard old Marching Ants), but to really see how your selection looks, I think the best View is Black & White, which shows your selection as a standard layer mask. As you can see, the Quick Selection tool, by itself, isn’t gettin’ the job done (the edges are jaggy and harsh, and there’s no wispy hair selected at all), which is why we need Refine Edge to help us out. However, the trick to working effectively in this dialog is to use just the Edge Detection section and, honestly, I would avoid the Adjust Edge section in the center altogether, because you’ll spend too much time fussing with sliders, trying to make it work. I figure you guys want me to tell you when to avoid stuff, too, and this is one of those cases. Next, turn on the Smart Radius check-box, which is the edge technology that knows the difference between a soft edge and a hard edge, so it can make a mask that includes both. This checkbox is so important that I leave it on all the time (if you want it always on, as well, just turn it on and then turn on the Remember Settings checkbox at the bottom of the dialog). 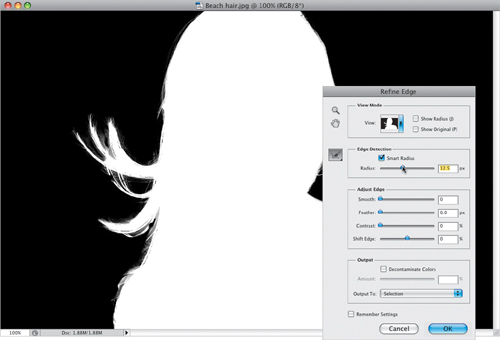 Now, drag the Radius slider to the right, and as you do, watch the hair on the left side. It doesn’t take a big move with this slider before you start seeing hair detail magically appear (as seen here). For simple selections, leave the Radius amount down low. When you have a tricky selection, like fine hair blowing in the wind, you’ll have to increase it higher, so remember: trickier selections mean higher Radius amounts. Now let’s change our view to see if there are any areas we missed. For this part of the process, I use the Overlay view (seen here), because the parts that didn’t get selected show up in white. So, choose Overlay from the View pop-up menu (as shown here). Although I generally only use the Black & White mask view and the Overlay view, here’s what the rest do: Marching Ants gives you just what you’d expect—a standard marching ants selection, just like always. On Black puts your selected area on a solid black background, while On White is on a solid white background (helpful if you’re doing selections of product photography, because you can see what the final image will look like). 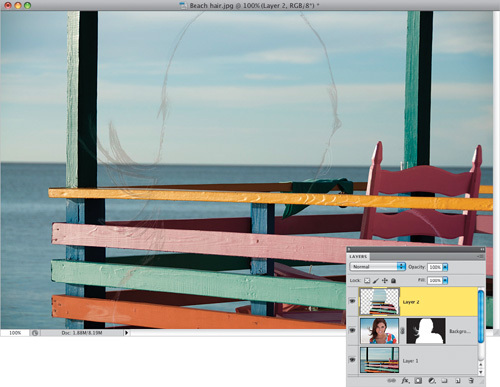 On Layers shows your selection on a transparent layer, and Reveal Layer just shows the original image without any selection in place (so it’s the before view). Like it says right there on the View menu, you can press F to toggle through the views. 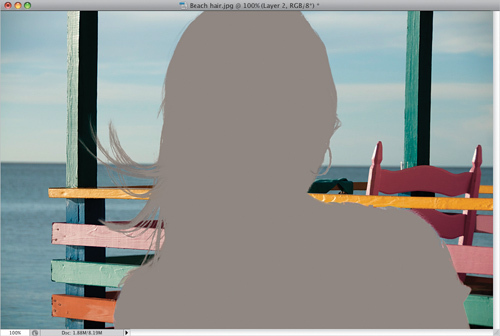 What you need to do next is tell Photoshop exactly where the problem areas are, so it can better define those areas. You do that with the Redefine Radius tool (E), shown circled here in red. Get the brush and simply paint over the areas where you see white peeking through, and it redefines those areas. This is what gives you that fine hair detail. If you look closely, you’ll see that her hoop earring on the right side didn’t get selected at all, so use the Left Bracket key to shrink the size of the brush down to where it’s just slightly larger than the hoop, then paint over it. It’ll look like it’s painting in white, but when you’re done, it just redefines the area and tells Photoshop that this area needs some work, and it “redoes” its thing. Now skip down to the Output section, where you’ll find a checkbox to Decontaminate Colors. 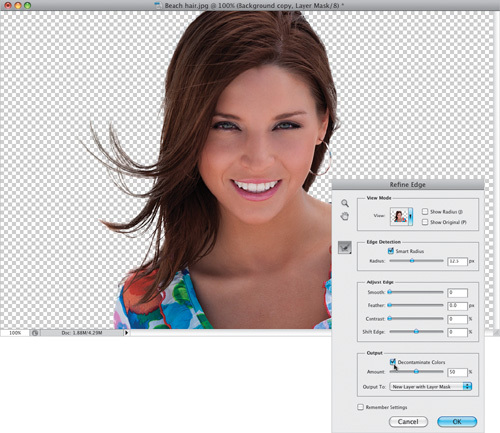 What this does is remove the color spillover on your subject from the old original background. It basically desaturates the edge pixels a bit so when you place this image on a different background, the edge color doesn’t give you away. Also, just below that, you get to choose what the result of all this will be: Will your selected subject be sent over to a new blank document, or just a new layer in this document, or a new layer with a layer mask already attached? I always choose to make a new layer (with a layer mask) in the same document. That way, if I really mess up, I can just grab the Brush tool and paint over those areas on the layer mask to bring them back to how they looked when I first opened the image. 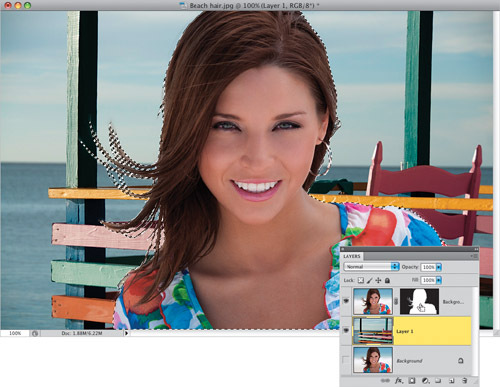 In the Layers panel, click on the background image’s layer (Layer 1 here), and drag it beneath the layer with your subject on it, so it appears behind her (as seen here). Chances are that the colors from the two images aren’t going to be right on the money, because they came from two different lighting scenarios. Her overall color looks much warmer than the background setting we’ve put her into, but I’ve got a trick you can use that will help make the colors work between the two. First, we need to load the layer mask on the top layer as a selection, so press-and-hold the Command (PC: Ctrl) key and click directly on the layer mask thumbnail (as shown here), and it loads the layer mask as a selection. 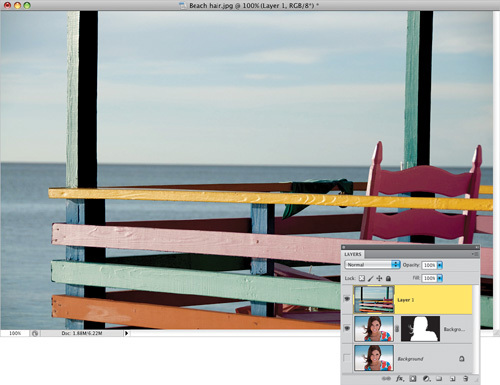 Make sure Layer 1 (the background image you dragged in earlier) is still the active layer, then press Command-J (PC: Ctrl-J) to put this selected area up on its own separate layer. 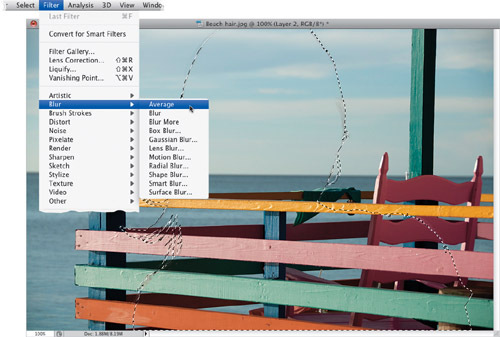 Now, drag this layer to the top of the layer stack (as shown here). Since this is a selection of the background, in the exact shape of your subject, you get what you see here—it looks like the background image, but with a thin outline around your subject. Well, that’s about to change. We need a selection around this layer again, so press-and-hold the Command (PC: Ctrl) key and click on the top layer’s thumbnail to load it as a selection. Once the selection is in place, we’re going to need to get a blend of all the background colors, so go under the Filter menu, under Blur, and choose Average. It doesn’t bring up a dialog or anything, it just does its thing, and creates a blur that averages all the colors in the selected area together (as shown here). Press Command-D (PC: Ctrl-D) to Deselect. It doesn’t look right yet, but it will in just a moment. To make this blend, there are two things you need to do: (1) change the layer’s blend mode from Normal to Color (so just the color shows through, instead of being solid); and then (2) lower the Opacity to around 15%, so a hint of the Average blur color from the background appears as a tint over your subject, and this ties the color of the two together (as seen here, where her overall color is more muted, like the background colors). This last step is totally optional and is based on the-depth-of field project, but you can add a blurred effect to the background image to make it look like the photo was taken using a wide-open f-stop to get a very shallow depth-of-field. You do that by clicking on the layer that has your background image (Layer 1 here), then going under the Filter menu, under Blur, and choosing Lens Blur (this gives a more realistic depth-of-field blur than a standard Gaussian blur). In the Iris section in the middle, set the Radius amount to 44 (that’s the amount of blur), then click OK to get the final effect you see here.